Chuck your notebooks, spreadsheets and budget for clear, tangible goals that are easy to track in real time. It may be for your holiday travel, education, family, car expenses, small business expenses or any other expenses you might have. Wallet by BudgetBakers is not just a finance expense tracker, report or budgeting app. It’s all about getting things under control now, so that you can make wise decisions and plan for the future – a month, a year or 10 years down the line. Automatic Bank Updates – Transactions are automatic and securely synced with your bank, smartly categorized and factored into your budget. With 3,500 participating banks worldwide, you’ll save loads of time not having to track every penny. Imports or Manual Bank Updates – You can now import all your transaction data from sources of your choice to Wallet so you will get a full report. Be it from your bank or your own spreadsheets. Flexible Budgets – Budgets help you plan & save money for the future thanks to the integrated finance manager. Whatever it is you need to accomplish, from paying off debt to buying a car or saving for retirement, Wallet offers the flexibility to meet your goals and cleverly react to any changing financial circumstances. Insightful reports – Easy-to-understand graphs and financial overviews give you actionable finance insights about the state of your finances, across bank accounts, credit and debit cards, debts and cash. You can get your income & expense report. Sharing selected accounts – Selected accounts can be shared with family, friends or colleagues who need to cooperate on a budget. Everyone can contribute from any platform, whether it be Android, iPhone or the Web. 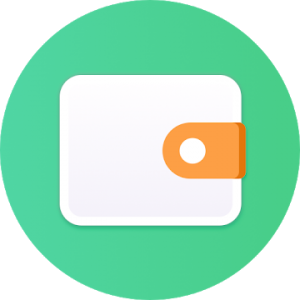 Loyalty and Reward cards – Upload all your plastic cards with bar-codes to Wallet to get rid of all the unnecessary junk which make your wallet extremely big and heavy. You can even share your cards with family members and collect points all in one account. Make your life lighter.